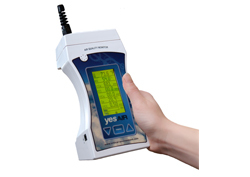 The YES AIR is a battery powered, portable air quality detection and data logging instrument designed for intermittent or continuous indoor air quality monitoring. With more features, flexibility and functionality than many IAQ instruments on the market today, the YES AIR is available in two model types (Pump or Diffusion), each with 30 different plug and play sensors to choose from. It comes with one temperature sensor, one relative humidity sensor and has the capacity for 5 internal gas sensors. In addition, it has an auxiliary port that will connect to the YES DUST, a general purpose particulate sensor. Sensor readings, battery level and data logging status can be viewed live on the multi-line, backlit, LCD display. 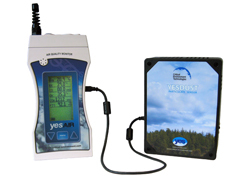 The optional YES Viewer Logger package consists of a 2 GB SD memory card with card reader, a USB cable and YES Viewer software. 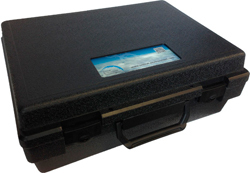 The card reader can be used to store or transfer data. Alternatively, data can be downloaded to a computer using the mini USB connection. The YES Viewer PC software allows users to analyze and graph data. An optional sampling probe is available with the Pump model. The probe has a 10 inch wand and 30 inches of tubing that fits onto the nozzle and allows you to reach into areas that are difficult to access.